FY 2019 would be stronger in terms of Y/Y production. However, the company would suffer in terms of higher costs and lower metal prices. Relief Canyon would revamp the mining profile of the company. A solid outlook for gold prices would also improve the NPV of the Relief Canyon project. Americas Silver Corporation (USAS) has two operating silver mines namely San Rafael (in Cosala, Mexico) and Galena Complex (in Idaho, USA). Moreover, the company also has another gold project namely Relief Canyon (in Nevada, USA). Its mining properties are located in the Americas. In this article, I have considered the operating performance of the company during FY 2018 in terms of output and production costs. I have also compared those metrics with the expected operational profile for FY 2019, to evaluate the company's performance outlook in the current year. USAS will significantly revamp its operational profile in the medium-to-long term, through the addition of the Relief Canyon project. This project has a pre-tax NPV of ~$160 MM. However, I believe that a strong outlook for gold prices would enhance the project NPV beyond the expected levels of $160 MM. This should support the share prices going forward. Let's have a look at Figure-2, that compares USAS's FY 2018 performance with the outlook for FY 2019 in terms of output and production costs. During FY 2018, USAS produced ~6.3 Moz (read: a million ounces) of AgEq (read: silver equivalent) production. The table shows that during FY 2019, AqEq production is likely to witness a significant upside and lie within the range of 6.6 Moz and 7 Moz. This Y/Y increase in AgEq production would cast a favourable impact on the company's revenues. However, USAS simultaneously expects an increase in its cost metrics on a Y/Y basis. The 'cost of sales per ounce of AgEq' is expected to increase from $8.29/oz in FY 2018 to the range of ~$8-10/oz. 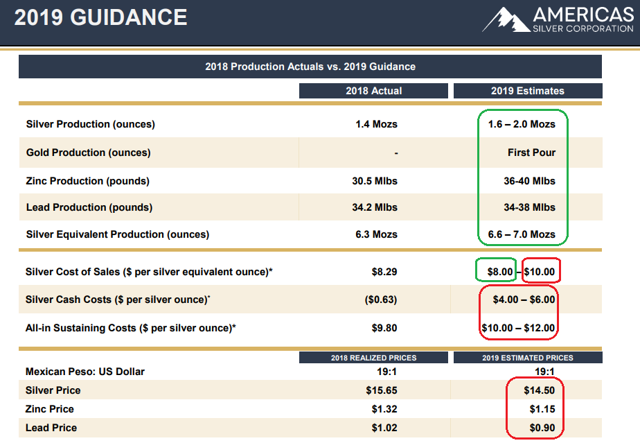 Since the company expects a Y/Y decline in average silver prices from $15.65/oz in FY 2018 to ~$14.50/oz in FY 2019, I believe this would also affect the operating margins in FY 2019. 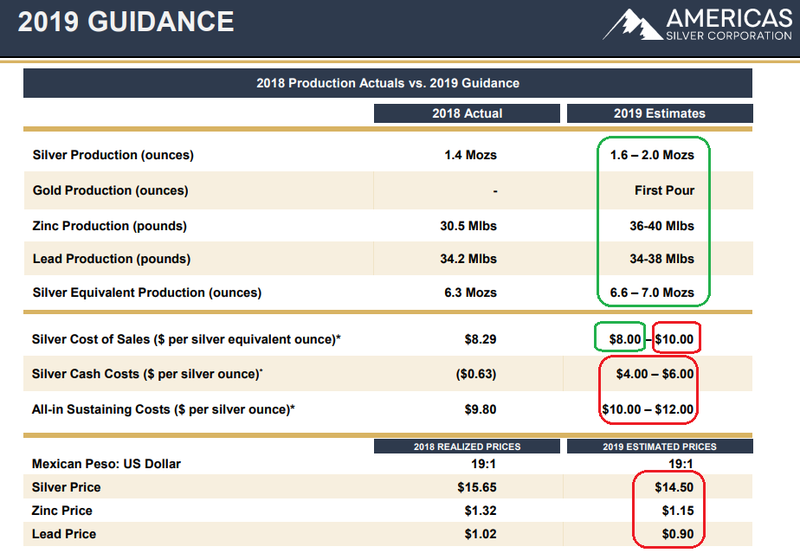 Nevertheless, USAS also expects to add the 'first pour' of gold production near the end of FY 2019. In my view, the addition of gold production potential would be a big positive for the company's mining outlook in future years (discussed in the following section). Relief Canyon will revamp the mining profile of the company. 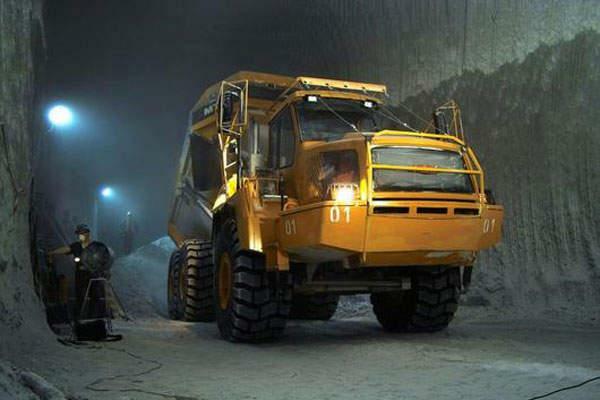 At present, USAS operations are based on silver mining at its two operating mines. The company has another pipeline project namely the RC (read: Relief Canyon). USAS recently obtained the approval of its Board of Directors for construction of the RC project and has also obtained a $42.5 MM financing scheme from Sandstorm Gold (SAND) to fund mine construction. It should be noted that the expected development cost of the RC project is ~$28-30 MM, in addition to the working capital requirement of ~$8 MM. Since the first pour from the mine is expected by the end of FY 2019, I believe USAS will be able to complete the construction of the mine within the current fiscal year and will deliver the first full year of production in FY 2020. On that note, it should be considered that the RC project will deliver ~91,000 oz of gold production each year. Moreover, once the RC project is fully operational it will enable USAS to significantly revamp its production profile. 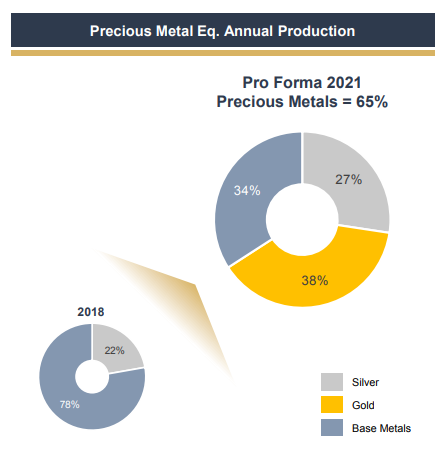 As seen in Figure-3, a large proportion of USAS's FY 2018 production was based on base metals (78%), and a relatively smaller portion was based on the precious metal (silver). The addition of RC project would enable the mining dynamics to significantly change over the next 3 years and the company expects the FY 2021 production profile to be based ~65% on precious metals and ~35% on base metals. 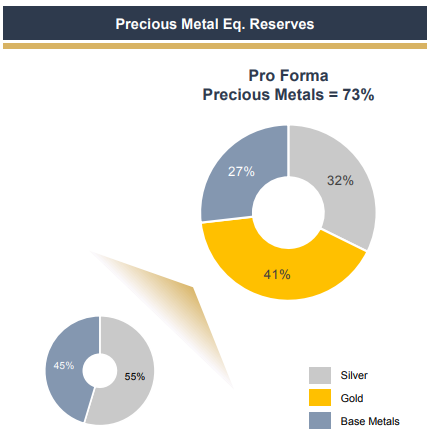 Moreover, the profile of 'metal reserves' show an even better picture with ~73% reserves related to precious metals and 27% reserves related to base metals (Figure-4). The RC project promises a pre-tax NPV of ~$160 MM assuming a gold price of ~$1,290/oz. At the time of writing, gold was already trading at ~$1,307/oz. (that is, higher than the expected long-term gold price that was used to derive project NPV). Since the RC project is expected to go live towards the end of FY 2019, it’s relevant to consider the outlook for gold prices from that time onwards to see if gold could actually maintain the price levels of ~$1,290/oz. Let’s have a look at the detailed five-year price forecast of gold (Figure-5). The table above shows that, except for Q2 2020, the ‘average forecasted gold prices’ for all other quarters exceed the $1,290/oz. mark. In my view, an expectation of healthy gold prices during the next 5 years would increase the NPV of the project and also help increase shareholder value. In the preceding discussion, we have seen that even though FY 2019 is likely to surpass FY 2018 in terms of production, but the performance may be affected by lower metal prices and higher costs. However, the troubled performance will be short-lived as USAS will add a gold mine in its portfolio of producing assets. This would enable the company to produce a significant volume of gold for the long term. Moreover, the healthy outlook for gold prices in the long-term would help increase the project's NPV and will also act as a catalyst for share price growth in the future.